Cast: Will Smith, Eva Mendes, Kevin James, Amber Valletta. Story: A date coach finds it harder then the boot's on the other foot. Well butter my cheeks and call me Maureen. A funny romantic comedy! I thought they were extinct. I've been looking forward to Hitch since I first saw the trailer months ago and, despite showing most of the best bits in the trailer, it still came up trumps. I can watch that fat bloke trying to dance over and over, and it's still fresh. Kind of like farting in church. 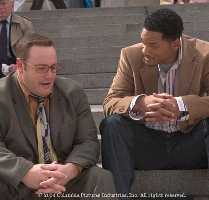 Both Will Smith and Eva Mendes are ideal as the lead couple, with excellent support from Hitch's clumsy fat student Kevin James and Amber Valletta as his out-of-reach quarry. In a less sensitive scenario, the whole date-training shenanigans would have been horrible, yet cleverly it is made to look like a public service, a way to level the playing field, helping the little guy make the most of what he's got to give him a fighting chance against the obnoxious arses whose previous conquests make women so guarded in the first place. He's like a modern day Robin Hood, but with more flirting and less pooing in the woods. Testosterone Satisfaction Rating: 1/5 It should be a chick-flick but it I reckon most people will dig it. To enjoy this film you should: be OK with a schmaltzy ending.